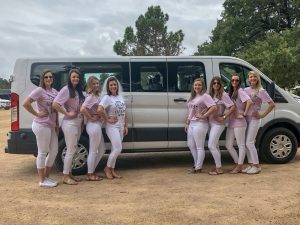 290 Wine Shuttle offers private wine tours seven days a week. Whether you prefer spending the day touring any number of Texas Hill Country wineries or making a little visit to a location off the beaten path, we are your best choice. Our staff of friendly guides is eager to make your experience a memorable event. Our tours are always flexible and created with your preferences in mind. All tours are individualized and can be customized regarding times, length, and destination. Go where you want and stay as long as you like. We operate a fleet of shuttle buses and 15-passenger vans available with a 24-hour notice. Our goal is to provide tours that are priced reasonably, designed to be flexible and customizable to meet your personal expectations! We can provide a private tour service for you and a friend or a small group for an hourly rate. You decide where you’d like to go and how long you want to stay. Tasting fees are not included. to and from the Wineries located in the Texas Hill Country. Want a Quick Tour? The shuttle is still the best value for a quick tour. Come when YOU want, visit the wineries that YOU want to enjoy, and return at any time during the day! You cannot beat the PRICE, VARIETY, FLEXIBILITY, and SERVICE. We offer affordable shuttle services in and around Fredericksburg, Texas. Call us when planning your next business conference or private event. We provide transportation services to both Fredericksburg and Kerrville, TX. 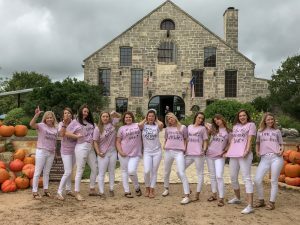 Bachelorette parties are once-in-a-lifetime events. Let us help you create an unforgettable afternoon of adventure including out of the way destinations, historic Fredericksburg, TX and, of course… the wineries. Leave the driving to us. No need for a “Designated Driver”. Private tour reservations require a 50% deposit when booking. The deposit is fully refundable if cancellation is made one week or more prior to the scheduled tour date. Cancellations within one week of the scheduled tour are non-refundable and the remaining balance charged for the number of guests booked. No partial cancellations accepted less than one week prior to the scheduled tour. NOTE: Stains due to spills or vomiting will result in an additional $200.00 cleaning fee.